My Dad kept sticky notes everywhere. Everyone knew that it was one of his things. 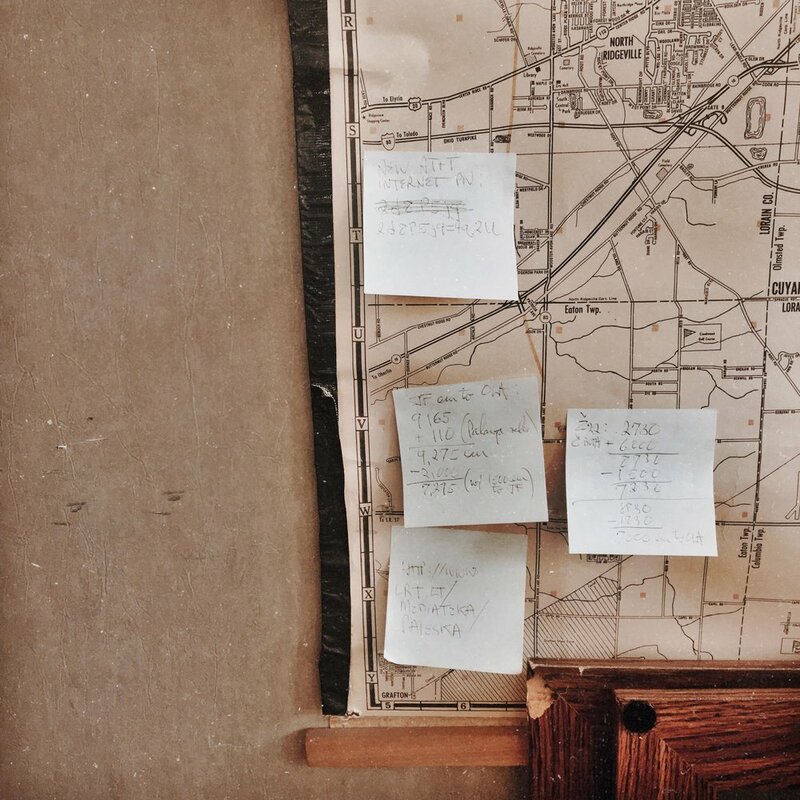 Everyone from his brother to his army sergeant knew that Edmund liked to keep sticky notes everywhere, on his desk, on his office wall, in his books. I do the same. And I've only recently realized because I figured it was something a lot of people did to stay organized. But I see now, that I have that same sporadic need to stick those little-multicolored notes around me, as a way to not only feel organized, but safe. I wonder if we both did it for the same reasons. I wonder if it’s because he was, like I am, trying to collect everything he felt, thought or experienced in one place, like capturing lightning bugs into a mason jar. I wonder if it's because we both had so many ideas and coming at once and we were attempting to lay it out, organize it and keep it noted and archived. All the things that inspired us , gave us joy, made us think, reminded us of the things we need to know: a quote, a phone number, a phrase, an important event. Anything to remind us that we're in control. I wonder if we were both just trying to grasp at the world around us as we went through it each day. In order to feel in control, feel at peace, keep our mind at ease. It’s our attempt to keep things organized, to annotate our lives with little reminders and to-do's. My mental state had hit a low in the last week. I had, what felt like, a deep pit of anxiety in my chest for 3 days straight, and was sleeping horribly (and still am). I couldn't focus on work because I was worrying too much about what I was supposed to be working on – yes, the irony kills me too. I've also been feeling a lot of dread about the future. Since graduation, there has been a huge space of emptiness that opened in front of me. I actually started writing this blog post way back during spring break of my final semester in college when I was feeling anxious about other things. I had a plan for spring break -- to rest, read, and catch up on work so I come back perfectly refreshed and productive. That was not the case. So the week following spring break I was starting to get into a more severely anxious state, to the point where I couldn't sleep, and couldn't get up. One of the problems that I had back when I was in school, and now the same thing now, was that I was losing control. Of myself, of the tasks, I had to do, of my routine. Everything was just coming all at once like an avalanche – and I didn't know where to start to start organizing what I had to do. Yes, I'm done with school now and it feels like a huge weight has been lifted off me. But in my head, I want to keep doing things, keep working, but I still feel my anxiety getting the best of me. And you guessed it, I feel even more guilty about it because well, I'm not in school anymore, what excuse do I have anymore? I have pitches I wanted to send out, essays to finish, a couple jobs to apply to, insurance companies to call etc. In theory, I could be in control if I just did things A, B, and C. But we all know it's not as easy as that. The bigger problem, however, was how much I let that get to me – that lack of having control. I should know better than most, that things are not always in your control. Things go haywire. Things go into chaos. I'm going into journalism, for God's sake – I should know this by now. What finally helped – unsurprisingly – was starting to make to-do lists again. As well as journaling and reading more. Writing things down – pen to paper - whether it was a reflection of a song or how I felt that day, it helped, it was a release. I've found that even having a to-do list in front of me helps immensely. I'm in an odd transition right now -- right out of college, trying to find my footing in life, while also attempting to just not beat myself up over not being where I want to be. Control has always been a big thing for me. And my fixation on control, or lack of it, has been the very thing that has fueled my anxiety over the years. The thing is, when it comes to the bigger events in our futures, our lives cannot be organized into a couple to-do lists. And I think that's what has been scaring me the most -- the fact that no matter how much I try, there will always be unexpected things coming up, derailing things, changing the course of things. For example, even when I tried to get myself to do things the last couple days, out of nowhere I got a migraine that made me bedridden for about 24 hours., The funny thing is, I'm pretty sure this was literally stress induced. Now, when I think about that in the case of my projects, deadlines, articles to finish, obviously that scares me -- and a simple to-do list can help fix that. However, when I think about the more abstract things -- like where am I going to be in the next 3 years, what will I be doing, where will I be living, what opportunities will come up? When thinking about that -- I don't feel any fear of change coming to me, rather than me having control over it. I recently finished John Green's newest book; Turtles All The Way Down. Honestly, at first, I wasn't expecting to feel that impacted by it. But the overall message behind it, the way it talks about mental illness, being stuck in your head, losing control and then finding it again -- really helped me deal with my own issues in a crazy way. It also made me think back to high school when I was in this same state; feeling out of control because of exams, grades, college applications, etc. The simple fact of the matter is, that I got through it. In the book, the main character is going through her own mental health issues, and even though I don't relate exactly to the same type of illness, I still related to a lot of what the character was going through; self-doubt, spiraling inside your head, falling in love, etc. It made me feel less alone. It also made me wish I could go back in time and talk to my teenage self and tell her that it's okay to feel like you're losing it sometimes. It doesn't make you weak. It doesn't make your feelings any less valid. This one really stuck out to me because it reminded me of the conversations I had to have with my parents, later on in college, about my mental health. Even to this day, whenever my mom talks to me about my anxiety, she has this hope in her eyes that it will be magically fixed after a couple therapy sessions or by just having "positive thinking." I don't blame her for this at all. I just wish I could tell her, the person who is most worried about me and wants me to be okay, that well, I'll be okay.